[Madison, Wisc…] The Senate is scheduled to vote on Gov. Scott Walker’s most recent tax cut package today, so we decided to compare Wisconsin’s tax policies under Walker in comparison to former Gov. Jim Doyle. The results are starkly different. In Doyle’s last budget, state taxes increased by $2 billion and property taxes increased by $1.5 billion. 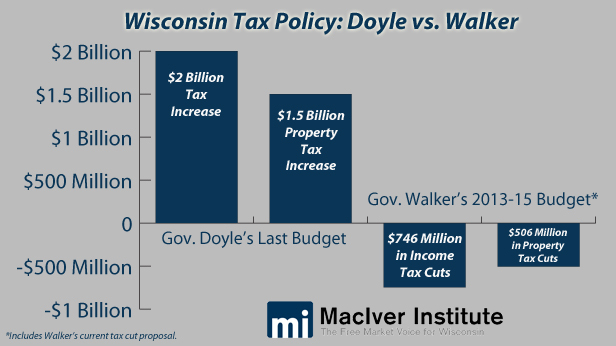 If Walker’s current tax cut package is signed into law, he will have cut income taxes by nearly $750 million and cut property taxes by more than $500 million in this most recent budget.